Up until a couple of months ago, I had no intention of using 'cleansing gadgets' as an extra step to clean my face. The idea of adding one more step to my skincare regime is just not encouraging. But do you think your face needs a more thorough cleansing than it gets with just facial cleanser? If yes, you are not alone. The need to clean the skin more thoroughly has spurred the invention of different facial cleaning tools. With so much to choose from, it can be hard to know where to begin, but I recommend this powerful tool to help make your face-washing experience more effective than ever before. This facial brush works double duty, using both sonic pulsations for cleansing and lower-frequency pulsations to reduce the signs of aging. The LUNA mini 2 is an enhanced T-Sonic face brush with eight adjustable intensities for a fully customizable cleansing experience. Foreo is innovative. 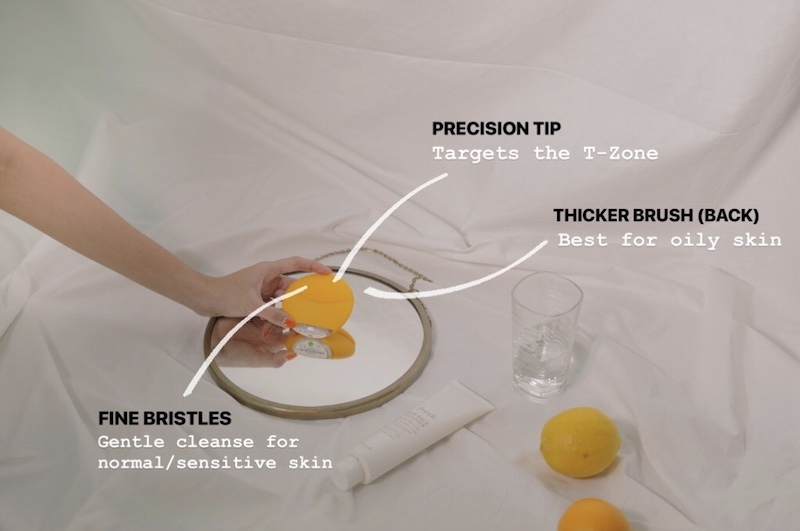 Unlike actual bristle brushes that spin or pulsate and may cause microscopic abrasions in the skin, its super soft silicone touch points pulsate to remove dead skin cells and unclog pores. These soft silicone bristles helps get into all the nooks and crannies, like around the nose and chin which often have blackhead/whitehead. The 3 touch points as shown below tell it all. This cleansing brush is safe to use day and night, for about a min. IT'S NOT AN EXFOLIATING TOOL. I prefer to use mine just once a day, in the evening as my second cleanser, to have a deeply cleansing experience. I find all my nighttime skincare routine really absorbs better into my skin than before. As my skin is dry, I don't feel the need to get to grime busting in the morning and usually just cleanser as usual. The LUNA mini 2 times itself for how long to spend on one place on the face, and gives a double pulse when it's time to move on to another area. Even easier, this gentle silicone facial brush is totally waterproof, and the silicone exterior rinses clean with just water - which means no grimy brushes or costly brush heads! Apart from effective cleansing, this tiny but mighty face cleansing brush comes in beautiful colours that make your skincare routine more fun. Since I'm a big traveller, the LUNA mini 2 is the perfect size to travel with and to have at home. My skin goes through so much in a day and even more when I travel. The dry air on the plane and the change in environment tends to irritate my skin. Ever since I started using this, it helps to keep my skin in check and more acne-free than just washing my face with hands. So if you're the type who's looking for a fuss free way of taking better care of your skin in the comfort of your home and on the go, the LUNA mini 2 is the best investment you can make for yourself! The FOREA LUNA mini 2, priced at RM636, is now available at Sephora online and at all Sephora physical stores in Malaysia. Nice blog thanks for sharing!